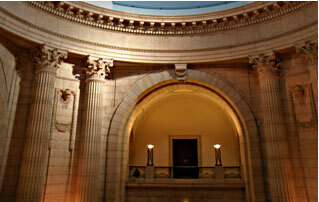 The Manitoba Legislative Building is a nationally designated Heritage site and prominent landmark in Winnipeg. Conservation, restoration and renovation are ongoing for the building and precinct. BridgmanCollaborative Architecture has undertaken several projects, including the new ramp, entrance vestibule, masonry work and statuary cleaning. BridgmanCollaborative completed a master planning document for 10 years of integrated projects with associated cost estimates in June 2009. An extensive document review, interviews, site assessment and associated cost estimate were compiled for this report. The report integrated priorities for life safety, code/standards, security, landscape, interior design, accessibility, heritage, and life cycle cost, as well as structural, mechanical and electrical issues. Work was prioritized based on critical action items and ongoing maintenance.The report was completed in 2009.